James Grage: Ketones. They fuel your brain but they also fuel your nervous system too, correct? James: So since a lot of strength is neural strength, being on a ketogenic diet might actually help you. Dr. O: As you know, these powerlifters say, “I did it all on this ketogenic diet!” They don’t realize it’s a different energy system. All you gotta do is just take a lot of creatine before and that’s gonna maximize or optimize that technique. That’s the phosphocreatine system. That’s two seconds. It has nothing to do with glucose or glycolysis or any of that stuff. There’s a big difference between correlation and causality. They’ve assumed causality – that they were able to get to that point by virtue of the fact that they’ve been on a ketogenic diet when in actuality it doesn’t have anything to do with it. It works! In other words you can be a powerlifter on a ketogenic diet. Can you be a big bodybuilder? No. It’s not gonna happen. James: So carb cycling. That’s another big trend. Whitney and I have both done carb cycling – so periods of very low carb and then periods of moderate carb. When it comes to insulin sensitivity, one of the potential down sides of the ketogenic diet is developing issues with insulin sensitivity. Dr. O: Right, even though that’s paradoxical. People think you’re going to be very, very insulin sensitive because all your insulin receptors are gonna be up regulated because there’s no insulin floating around. In actuality what ends up happening is that your body sort of loses the ability to even utilize insulin because you’re not using glucose as an energy source. Dr. O: Correct. You may see a bit of a bump in your hemoglobin A1c – so your long-term measure of blood glucose control – may actually go up slightly when you’re on a ketogenic diet. So you go, “Uh oh!” Meanwhile, you’ve shed 40 lbs. of body fat, your inflammatory markers are down… But what’s the real barometer of whether or not you are doing something good for your body? You see your hemoglobin A1c go up, which is bad for your body. Right? That means you can’t really process blood sugar well and you’re less insulin sensitive. Check the fasted insulin level. Dr. O: It’s gonna be really low. Does that make sense? That’s the big thing! That’s why you can’t get tricked. Why is your hemoglobin A1c going up? Because you are a little insulin resistant. James: So in a carb-cycling scenario, let’s say five days of low carb and then 2 or 3 days that are a little bit higher. Would that potentially help with insulin sensitivity? Dr. O: Probably. Remember, if you’re not “clamped” metabolically speaking, five days on and five days off probably isn’t going to hurt you. Whereas, as an example, if you were fully ketogenic and you’d been on the diet for six or twelve weeks, then you’re “clamped.” You’re keto adapted. You are functionally insensitive at that point. I don’t know what this looks like, but if you were to have a bolus of carbohydrates, your sugar is gonna go straight through the roof. Dr. O: Right. You’re not gonna process it. I don’t know what the data is, but that said, and I know this from personal experience and from my friends and family that have been on a keto diet: if you do that and you are “clamped,” if you have crap to eat and your sugars run up, I can tell you that when they do come down, your body is not going to be out of ketosis. If you go right back on the eating regimen, you’re not gonna take three days to get back into ketosis. That’s why I call it the “clamp.” You’re metabolically clamped. James: That is if you go back on a ketogenic diet. My concern is long-term sustainability. I’m gonna piss off all my vegan friends out there, but the reason I use this as an example is that I’ve watched every single one of them go back to eating meat at one point. I’ve even seen it after crazy periods of time. Ten years! 15 years! Dr. O: What was the reason? James: They sat in a restaurant and a steak went by and they went, “Mmmm man…” Then they ate it and thought, “What was I doing? !” So my concern is, what happens when you do a ketogenic diet over a long period of time and you become insulin resistant but then you go back to eating the way you did before. Dr. O: Well going back to the way the individual was eating before, I assume it was eating badly. James: An American diet. Eating a lot of high-glycemic carbs. Dr. O: My thought is that the body is very smart and probably transitions over fairly quickly. James: It has to. Otherwise you’re gonna die. Dr. O: Ya, exactly. Your blood sugars are gonna be through the roof. Then you stress the pancreas and just start producing more insulin. Which is one of the reasons why being on these low-insulin diets is also good. There’s less pancreatic burn out because you’re not constantly secreting insulin into the bloodstream. One of the reasons people become insulin resistant – and a lot of people don’t know this – is not because you become peripherally insulin resistant at the level of the cell, it’s because your pancreas burns. 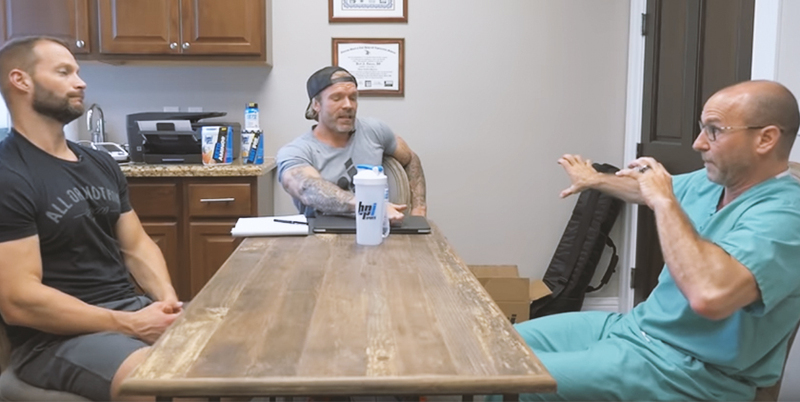 James: So you can become insulin resistant by not having any carbohydrates or very low carbohydrates over a long period of time, but can’t you also become insulin resistant by having too much carbohydrates over a long period of time? Dr. O: Of course! It’s called Type 2 diabetes.